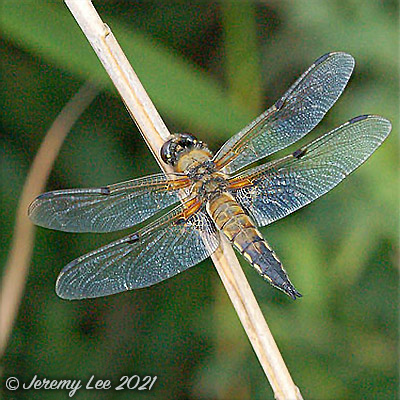 Libellula quadrimaculata, more commonly known as the Four-spotted Chaser, is a medium sized dragonfly with body length about 25-35 mm. Both sexes have a brown ground colour becoming darker over the head and almost orange on the thorax sides. The posterior half of the abdomen is black with the sides of the abdomen edged yellow. The wings are suffused bright amber at their bases and both fore and hind wings have a dark patch about half way along their leading edges and a pronounced black stigma near the wing tips hence the common name of this chaser. There is also a black triangular patch immediately behind the amber suffusion of the hind wings. Male Four-spotted Chasers aggressively defend their territories from prominent perches around the margins of pools and ponds and ward off any intruders. Mating takes place in the air and the female lays her eggs in floating vegetation. This species prefers warm sites with ponds or ditches with still or slowly moving water.